West Point Thoroughbreds' Terry Finley, Tom Durkin and partners own a piece of the winner. As Always Dreaming reached the finish line of America’s most important horse race just before 7 p.m. on May 6 at Churchill Downs, Terry Finley stopped hollering encouragement to jockey John Velazquez, looked down and began dealing with an avalanche of emotion. Moments later, he was wiping away tears. Thirty yards to Finley’s left, retired track announcer Tom Durkin made no attempt to restrain himself. Indeed he did—by 2 3/4 lengths over a track labeled “wet-fast,” following three days of rain in Louisville, Kentucky. Always Dreaming’s victory brought Finley and Durkin—horse-racing lifers, well-known in the game and now residents of Saratoga Springs—to the promised land of America’s oldest sport: the infield winner’s circle used just once a year to honor the Kentucky Derby winner. Finley, the CEO and president of Saratoga-based West Point Thoroughbreds, negotiated the purchase of a minority interest in the colt in March. Durkin—the voice of the New York Racing Association from 1990 until 2014, calling Triple Crown races and the Breeders’ Cup on national television for many years—is one of five West Point investors in the son of Bodemeister. He watched the Derby on the huge video board from ground level on the horse path between the paddock and the track. “I’m feeling pretty good. This is better than being up there,” Durkin shouted over the din while pointing in the direction of the announcer’s booth. Always Dreaming had trained far too aggressively the week before the race, and Finley wasn’t sure what to expect. Looking for signs, he watched how the colt reacted during the noisy pre-race hoopla. He was encouraged when Always Dreaming remained calm, walking from the barn in front of the crowd of 158,070 and keeping his composure while being saddled. When the colt was relaxed and responding kindly to Velazquez during the first run through the stretch, Finley got excited. “I was like, ‘they’re going to have a tough time beating us,’” he said. Terry Finley, West Point’s president and CEO, wearing a blue blazer and a yellow necktie, made the traditional pre-race walk with the horse from the barn area to the paddock. Always Dreaming showed promise in his two sprints races in 2016, and blossomed this year with new trainer Todd Pletcher, winning three straight when asked to run longer distances. In the Derby, he ran comfortably alongside pacesetter State of Honor through the first turn and up the backstretch. Coming out of the second turn, Always Dreaming spurted away from State of Honor and Irish War Cry to take the lead into the stretch. Finley and his wife Debbie formed their partnership business with one horse in 1991 and named their fledgling company after his alma mater. West Point Thoroughbreds started life in New Jersey, but its headquarters has been relocated to Saratoga Springs. The Finleys, COO Tom Bellhouse, CFO Lindsey Heumann and controller Susan Hedge all live in the area. 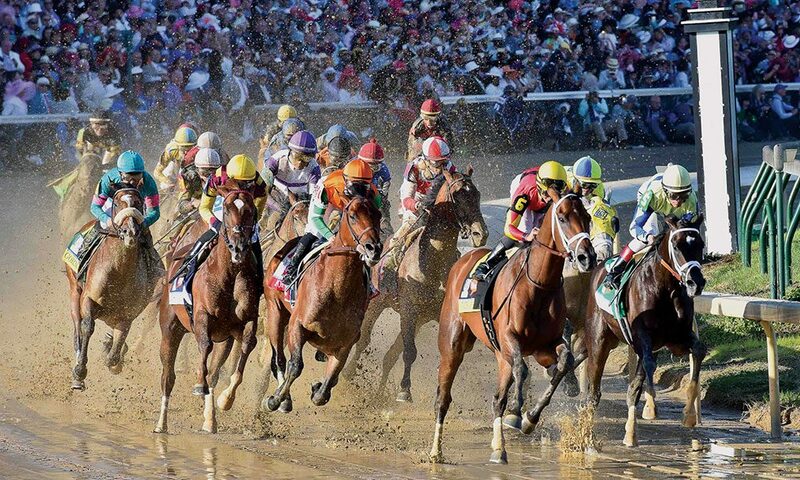 There’s certainly no surprise that Saratoga Springs is connected to the Kentucky Derby. Since 1863, Thoroughbred racing has taken place at the nation’s oldest race track, on Union Avenue. Many prominent racing companies and individuals are based in Saratoga Springs and around the Capital Region, and there have been Derby links for more than a century. John Sanford of Amsterdam owned the 1916 Derby winner George Smith; Amsterdam businessman Herbert P. Gardner bred and owned the 1929 winner Clyde Van Dusen, named after his trainer. In 1992, Snappy Landing, owned by Saratoga businessman Fred McNeary, ended up 17th in the Derby. Albany investment broker Tom Healy was a partner in Halory Hunter, who was fourth in 1998. In 2003, Jack Knowlton of Saratoga Springs was the managing partner of Sackatoga Stables, owner of Derby and Preakness winner Funny Cide, a group that included two other Capital Region residents. Marylou Whitney’s Birdstone was eighth in 2004. Ray Bryan of Saratoga has been a partner in Donegal Racing’s last two Derby horses, Dullahan, third in 2012, and Keen Ice, seventh in 2015. Jockey John Velazquez acknowledges the reaction of the crowd as he rides Always Dreaming back to the winner’s circle following his 2 3/4-lengths triumph in the Kentucky Derby. Velazquez, a member of racing’s Hall of Fame, won the Derby for the second time. This year, trainer Chad Brown—a native of Mechanicville whose wife and daughters live in Saratoga—saddled the fourth Derby starter of his career. Practical Joke, co-owned by Colonie native and Saratoga homeowner William Lawrence, finished fifth. Lawrence has owned many horses with partner Seth Klarman’s Klaravich Stables during the past 10 years, but Practical Joke, winner of the historic Hopeful at Saratoga last summer, was his first Derby runner. Anthony and Mary Ellen Bonomo of Manhasset, and trainer Dominic Schettino, were the listed owners of Always Dreaming during his two-race 2-year-old season of 2016. They acquired him as a yearling for $350,000. Vinnie and Teresa Viola purchased a major position in the colt before he earned his first victory in January. Anthony Bonomo and Vinny Viola knew each other as kids growing up in Brooklyn. On March 20, West Point and Siena Farm of Paris, Kentucky, combined to buy a 25 percent stake. Durkin invested in the West Point share in April. Always Dreaming is West Point’s third Derby horse. Flashy Bull was 14th in 2006, and Commanding Curve was second to California Chrome in 2014. While West Point has had plenty of success through the years—and is the largest racing partnership in the country with 70 horses and 500 partners—they were still seeking a victory in a Triple Crown race. Finley expects Always Dreaming’s win will help his company.